Automated email marketing is mega popular right now – and it’s easy to see why. The statto’s are saying that automated emails get 119% higher click rates than broadcast emails, and can lead to conversion rates as high as 50%. And, with so much user data around – both demographic and behavioural – we can increasingly combine automation with personalisation. These two former enemies are now getting along like a house on fire, giving marketers the power to send tailored, relevant and behaviour-driven content with just a few clicks. The result is incredibly powerful, with many companies reporting increased revenue by up to 18 times over. You might know Airbnb best from their…er, controversial rebrand back in 2014…but they’re certainly doing an awesome job with their email onboarding. The company, a travel marketplace where people can list, discover and book unique accommodation, immediately follows up all new signups with a ‘Before starting your adventure…’ email. Clearly, it’s beautifully designed and easy to scroll through. But it also encourages users to take a few key steps to complete their profile, and get the most out of using the service; they’re advised to add a profile pic, verify their information and then get going! According to BlueHornet 74.4% of people expect to receive a welcome email right when they subscribe, and chiefmarketer.com suggest that subscribers who receive a welcome note show 33% more long-term brand engagement. Finally, MarketingSherpa research suggests that welcome emails have a staggering average open rate of 50%, making them 86% more effective than an email newsletter. For all these reasons, sending out a welcome email to your new users or subscribers is definitely a smart move and something we’d recommend! Imagine if your best mate forgot your birthday? They’d be squarely in the doghouse. Okay, nobody’s expecting you to be your customer’s best pal – but clearly, a birthday greeting is a nice way to go above and beyond for your customers once a year. It’s a simple tactic demonstrated well here by menswear company, Burton. Not only is there the personal, relationship-building element that the customer feels the brand cares about them – they’re being offered a real incentive to buy in the form of a 15% discount. In fact, far more than just being a yearly digital cuddle for your customer, the numbers suggest birthday emails are a great sales tool. ClickZ report that birthday emails convert by 60% compared to non-birthday emails with the same offer, and that they can result in a 30% lift in opens and a 60% lift in clicks – all really important metrics. The crazy thing is that MarketingSherpa reckon that only 24% of online businesses actually send date-triggered email. The best thing is, most websites will ask for a date-of-birth as part of the signup process, so this is data that you probably already have. 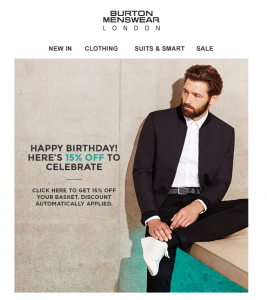 A birthday campaign with a nice incentive or giveaway is incredibly easy to execute, and can have a noticeable impact on traffic, sales and subscriptions. We’ve all experienced those holiday blues when we get back to the grind after a short break – and often, the only antidote is to book another holiday! 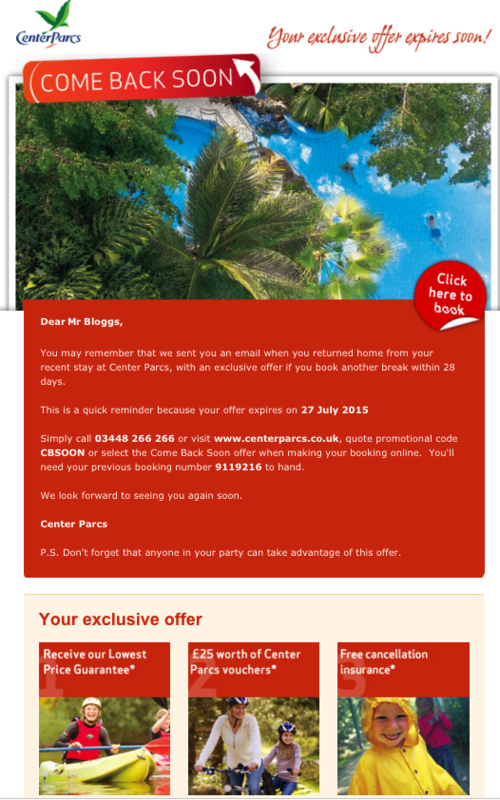 Short-break holiday company Center Parcs do an awesome job of cashing in on that sentiment with their ‘Come Back Soon’ offer. This offer allows guests who’ve stayed with them in the last 28 days to book another break, and receive a host of benefits – a lowest price guarantee, £25 worth of vouchers and free cancellation insurance. Throughout those 28 days they drip-feed emails to eligible guests reminding them about the offer and creating a subtle but powerful sense of time-sensitivity. A high number of returning guests has played a part in the achievement of occupancy rates over 97% as of 2014. They’re definitely doing something right! You don’t need to be selling holidays to recognise that one sale is just the beginning. Ask yourself, when somebody buys your product or service, when are they likely to need it again? Using this information, you can set up powerful timed campaigns that nudge your customer to renew or re-purchase at just the right moment. It’s no secret that customer feedback is like gold dust for any business. Feedback, good or bad, can help you strengthen your strengths and cut out your weaknesses. In the digital age, public feedback is especially important. It’s been suggested that customers trust reviews made by other impartial users twelve times more than manufacturer descriptions, and that extra trust is a crucial element in driving sales and conversions. ASDA send a request, like this one, for feedback on each customer purchase. It’s an easy follow-up that again has two core benefits. Firstly, it’s a nice post-sales touch – it tells the customer that they don’t stop caring as soon as their order is shipped; they want to know how they found the product, and whether it met their expectations. Secondly, it generates vital content that can help sway future shoppers in the right direction. 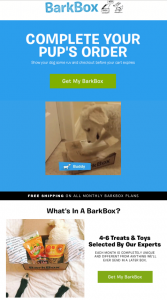 The Monthly subscription model is increasingly popular in online retail, and BarkBox was among the first to adopt it. The basic principle is simple; you pay a monthly subscription, and, each month, a doggy care package full of treats and toys is delivered to your door. The problem is, sometimes, customers will start the process and, for whatever reason, not quite complete their purchase. That’s why abandoned cart emails like this are awesome. Clearly there are a number of reasons why carts are abandoned, but the users behaviour tells us that there’s at least some solid interest in buying. 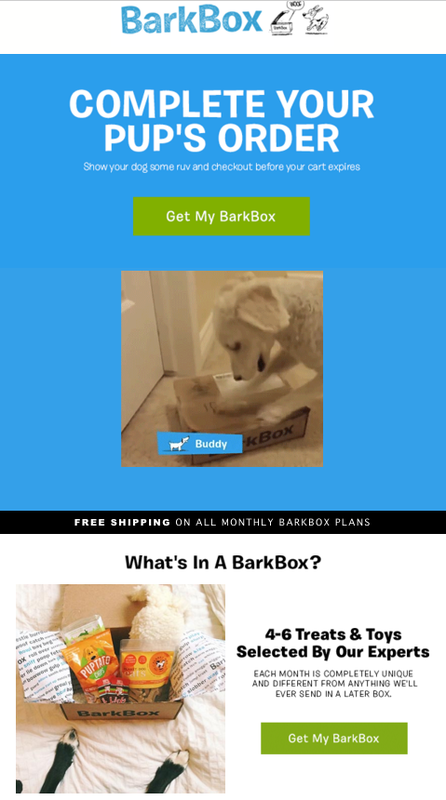 This campaign from BarkBox uses emotive language, powerful imagery and beautiful design to try and nudge those floating customers over the line. We love it! 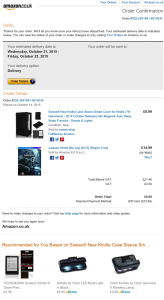 Amazon aren’t just the kings of e-commerce – they’re not doing a bad job on marketing automation, either. 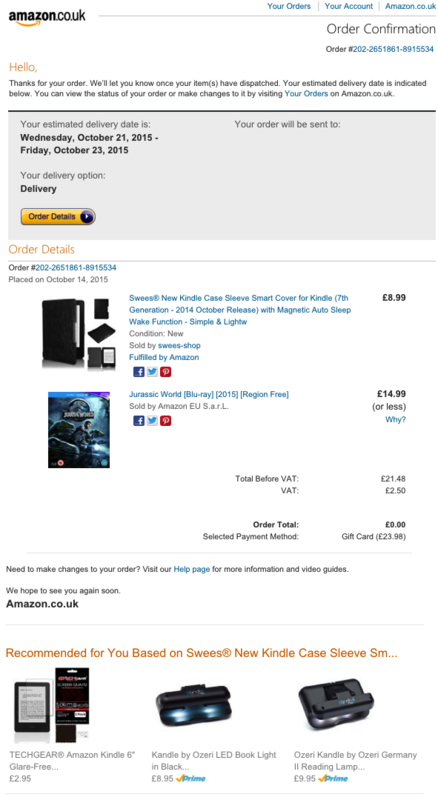 Whenever customers place an order through Amazon, they’ll receive an order confirmation just like this. On the surface of it, this is simply a way to let the customer know that you received their order and that you’re beginning the process of getting it over to them. It’s been suggested that between 2011 and 2013, the use of order confirmation emails to achieve other email marketing objectives rose by 250%. You can see from the example here that this can be a really powerful cross-selling and up-selling opportunity – a chance to offer up similar or complimentary products based on each particular purchase. 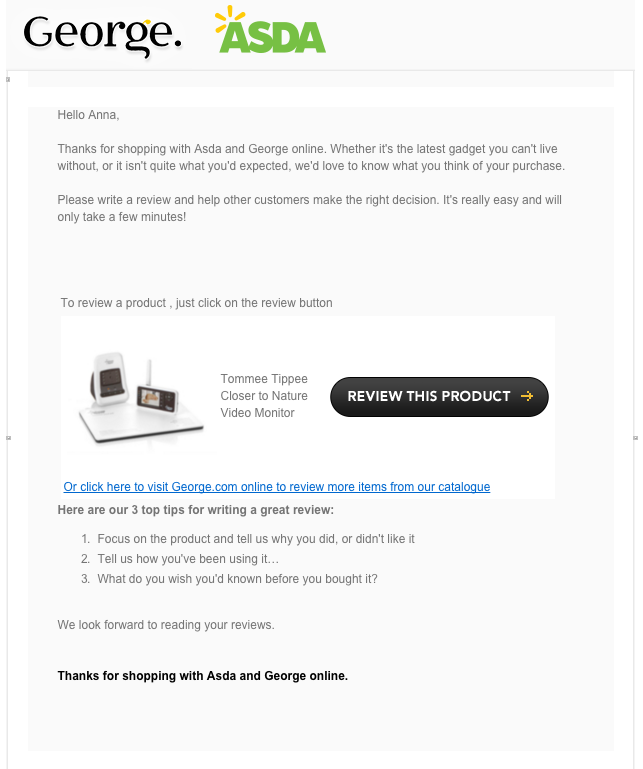 So there you have it, 6 real-world examples of automated email done right. We’ve picked out a few ‘big’ companies in this article, but that doesn’t mean that it’s limited to those guys! Email automation has never been so accessible to businesses of all shapes and sizes. It’s increasingly expected by your customers. Keep an eye out for ‘Instiller’s Complete Guide to Email Marketing Automation,’ coming soon – with tips, tricks and hints to help you get started.